Before reading please note that the stats listed in the article below are from previous Pokémon games. In Pokémon Go, CP (Combat Points) represent how strong a Pokémon will be in battle. In addition, the offensive Type Effectiveness of a Pokémon is determined by the Type of Move that is used. Since the beginning of Pokemon time, one of the most common questions and debates among Trainers is... Which Starter Pokemon is Best? Within the Pokemon Community there are strong arguments for each one. However, before doing a detailed comparison analysis of Bulbasaur, Charmander and Squirtle, the first question that should be answered is what is the meaning of "Best"? Best can be personal preference of Pokemon Appearance/Personality or it can be more technical such as Stats, Moves, Evolutions, Advantage vs. All Pokemon Types, etc. Being that Pokemon appearance and personality is more subjective it is difficult to quantify. Therefore this four category comparison will be more geared towards an objective review approach. At the beginning of the game Bulbasaur has the total stat point advantage and is more balanced across the stat categories. Charmander has nine less stat points than Bulbasaur, but has more attack and its speed stat is much greater. Out of the three Pokemon, Charmander will be granted the first attack in battle due to this Speed advantage. Squirtle has the defensive advantage, which means it will take less damage vs. the other two starters (disregarding type effectiveness). After evolving, each starter's total number of stat points is identical at 405. While the total amount of stat points is equal, the allocation % by category still gives advantages to each Pokemon in their respective strengths. Ivysaur maintains its balance across all stat categories. Charmeleon gets the significant Speed edge and slightly greater attack. Wartortle has the distinct Defensive advantage with Defense and Special Defense at 80 points each. 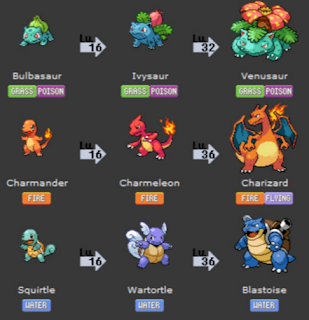 Once evolved into Venusaur, Charizard and Blastoise the overall number of stat points is no longer identical. Charizard comes out on top with 9 more stat points than Bulbasaur and 4 more than Blastoise. The HP and Attack stats remain similar with only 1-2 difference in points. Blastoise continues to have the advantage in both Defense and Special Defense, but is the weakest in Special Attack (24 Point Difference vs. Charizard). Charizard continues to have the advantage in Special Attack and Speed, but is weakest in Special Defense (20 Point Difference vs. Blastoise). It also has the lowest Defense (22 Point Difference vs. Blastoise). Venusaur is not the clear cut winner in any category it has slightly highest HP and does not lose in any category by more than 17 points. Bulbasaur/Ivysaur/Venusaur: Maintains balanced stat allocation throughout evolutionary stages. Charmander/Charmeleon/Charizard: Stats are more focused on Speed and Offensive Categories. Strengths: Offense. Ability to strike first in battle. Higher attack = more damage dealt. Weaknesses: Will take more damage due to lower Defensive stats. Squirtle/Wartortle/Blastoise: Defensive. Stats focused on Defense. Strengths: Defense. Will take less damage from incoming attacks. Weakness: Will deal less damage due to lower Attack stats. A trainer who is less risk averse may choose a safer, more balanced approach and go with Bulbasaur. A trainer who believes Defense is the best Offense will likely go with Squirtle. A trainer who prefers a more Offensive battle and doesn't mind taking increased damage will go with Charmander. Every Pokemon is made up of one or two different Types. Every Type has different strengths and weaknesses in battle. 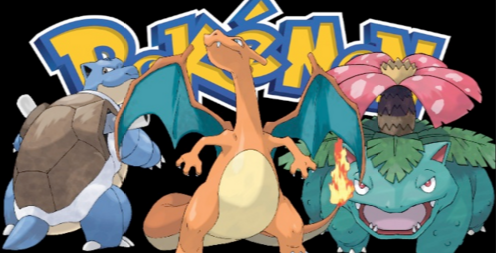 Among these three starters, Charmander is a Fire Type, Squirtle is a Water Type and Bulbasaur happens to be both a Grass Type and a Poison Type. Being a Dual-Type allows Bulbasaur to have an Offensive advantage over five different Types of Pokemon (Greatest of the three starters). However, being a Dual-Type Pokemon also puts Bulbasaur at a Defensive disadvantage against seven different Types of Pokemon. Charmander has an Offensive advantage over four Types of Pokemon and a Defensive disadvantage against only three. Squirtle has an Offensive advantage over three Pokemon and a Defensive disadvantage against only two. This stat further proves the fact that Squirtle is the strongest Defensive Pokemon of the other three starters. Overall, Charmander and Squirtle are in good shape as they are stronger against more Types than they are weak. Bulbasaur has a more difficult time as he is weaker against more Types than he is strong. 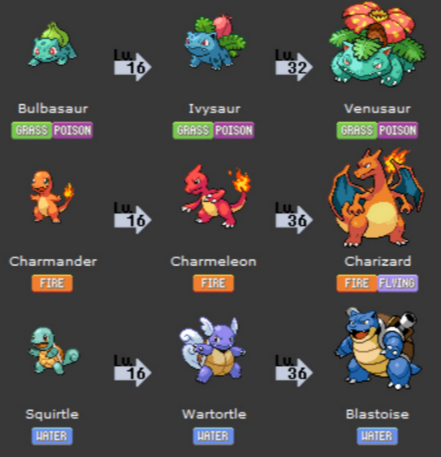 The total number of Pokemon of each Type, including Pokemon with Dual-Types, is as follows (Data from PokemonDB.net). Based on this chart, aside from Normal Types, the greatest number of Pokemon Types are Water, Flying and Grass. On the other end of the spectrum, the least number of Pokemon Types are Fairy, Ice and Dragon. With the total number of Pokemon of each Type being 1,164, approximately 10% are Water, 8.5% are Flying and 8% are Grass. Furthermore only 3% are Fairy, 3% are Ice and approximately 4% are Dragon. Now what does this mean for our three starters? With Water, Ground, Rock, Grass and Fairy Type Pokemon making up about 32% of all Pokemon (370), Bulbasaur is Strong against a almost 1/3 of the entire Pokemon pool. However, Fire, Ice, Poison, Flying, Bug, Ground and Psychic Types make up almost 41% of all Pokemon (474), which means Bulbasaur is weak against a little less than half of all Pokemon. Based on similar calculations, Charmander is strong against (249 Pokemon = 21%) and weak against (240 Pokemon = 20%). Very balanced. Based on similar calculations, Squirtle is strong against about 15% of all Pokemon and only vulnerable to about 12%. This is largely due to the fact that Water is only vulnerable to Grass & Electric Types and Electric Types only make up about 4% of all Pokemon. Bulbasaur has balanced stats even throughout its evolutions. Being both Grass and Poison Types allows Bulbasaur to have an advantage against one third of the Pokemon out there. However, being two different Types comes as a double edged sword as it leaves Bulbasaur very vulnerable to 41% of Pokemon. Overall, Bulbasaur will have an even matchup or an advantage against approximately 59% of all Pokemon. Charmander's stats are focused on doing more damage and always being the first to attack (Attack, Special Attack & Speed). Being a pure Fire Type, Charmander has the advantage against only 21% of Pokemon, but at the same time is vulnerable to only about 20%. Overall, Bulbasaur will have an even matchup or an advantage against approximately 59% of all Pokemon. In addition, once Charmander evolves into Charizard it gains the highest base stat point total of all three starters (524). Squirtle's stats remain strong on the Defensive side through both evolutions. Although its Attack and Special Attack stats are lower than that of Charmander and Bulbasaur, being a Water Type makes Squirtle vulnerable to only two Types (Electric & Grass). This means that Squirtle will have a poor matchup against approximately 12% of all Pokemon, but a Neutral to Excellent matchup 88% of the time! Who is your favorite Starter??? Please leave a message in the comments section at the end of this page. Personally I will be using Bulbasaur in Pokemon Go. Bulbasaur only has 4 weaknesses. You didn't take into account resistances. Because of the resistences of grass and poison, it's only weak to flying, psychic, fire, and ice.